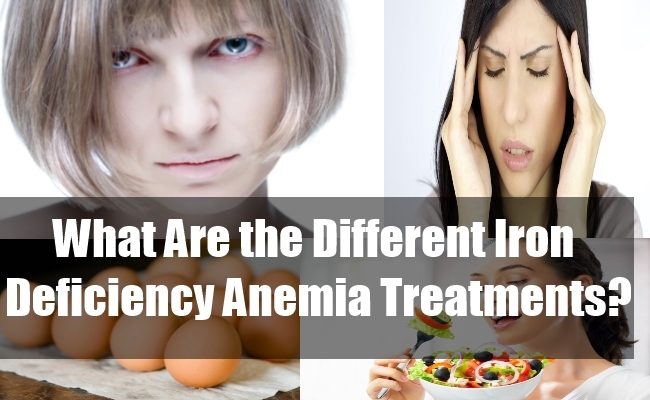 What Are the Different Iron Deficiency Anemia Treatments? Anemia is the most common blood disorder in the world. Millions of people suffer from it on a daily basis. There are many different types of anemia. The most common type of anemia is iron deficiency anemia. Anemia occurs when there is an inadequate amount of red blood cells. This causes a decreased amount of hemoglobin. Hemoglobin is a substance in the red blood cells that is iron-rich and responsible for transportation of oxygen to the body’s organs and tissues. When there isn’t enough hemoglobin or red blood cells to transport the oxygen, the body does not get enough and therefore, it cannot function properly. Iron deficiency anemia is caused by a decreased amount of iron in the body. Since the hemoglobin requires iron, if there isn’t enough, the hemoglobin production will decrease and it will not function correctly. Iron deficiency anemia treatment will then be needed to get rid of the symptoms. The symptoms of iron deficiency anemia are similar to all type of anemia symptoms. Fatigue, weakness and lack of energy are the most common symptoms of the disorder. This is caused by the organs and tissues working overtime and not getting enough oxygen. The body will become tired and weak. Headache and dizziness are also common symptoms of the disorder. If the brain is not getting enough oxygen it can cause a lightheaded feel and possibly even a fainting spell. Iron deficiency anemia treatment is usually very simple. One of the most common iron deficiency anemia treatments is to take an iron supplement. The supplement will increase the amount of iron in the body and feed it to the hemoglobin. More hemoglobin will produce and it will work properly. This will allow the red blood cells to transport the oxygen throughout the body. Another iron deficiency anemia treatment is change in diet. Adding some iron-rich food will help your iron level increase. Red meat, eggs, leafy greens and beans are examples of food that have a high amount of iron in it. In some cases, you may experience blood loss caused by the disorder. If this is the case, the only iron deficiency anemia treatment that will completely work is a blood transfusion. Doctors do not like to perform these and only use them in severe cases, but sometimes they are needed. The transfusion will replace the blood loss and in doing so, will give the body a sufficient amount of healthy red blood cells. The cells will have iron-rich hemoglobin and will be able to transport the oxygen throughout the body. There are a few different iron deficiency anemia treatments that can help. Which one you need depends on the severity of your symptoms. If you suffer from iron deficiency anemia, speak with your doctor about which treatment is most beneficial for your needs.